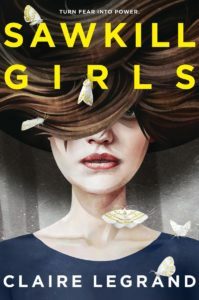 Sawkill Girls was delightfully eerie. There were morally grey character, bisexuality, some asexual feelings and a paranormal horror kind of vibe. I was actually terrified to read Sawkill Girls but I actually fell in love with it. Having only read Furyborn and Some Kind of Happiness before, Sawkill Girls is something else entirely. It’s eerie and has this distinctly dark vibe to the story. But it’s so delightfully good. Not only do we have an amazing cast of girls: Zoey, Val, and Marion, there is such a large story behind Sawkill Girls that will hook you. First off, if I was a girl here, I’d be Zoey. There is a delicious and deliriously complex mystery to the book. You want to always read to unravel what is going on. As we find out more and more, the scope only keeps growing. The characters keep developing, and you lose track of where the ground is. The queerness is off the chart. There’s bisexuality, lesbianism, poc, and ace-spectrum feelings. I want all the queerness in this book in every book from now on. Thank you for coming to my review. The ace-ness and the ways this character deals with the rhetoric is something that just gave me all the feels. Dealing with this struggle and relationships has been such a challenge, that this was really affirming to see. The friendships and relationships between the three girls are amazing. It’s girls banding together, girls who are enemies, and girls who love other girls. The friendship is why I stayed in the story. I wanted to see how they’d develop, how their lives would interact. It’s a book that is founded on strong and compelling characters. Legrand weaves a web we fall helplessly into. There are parts of the story from outside perspectives that give the book a haunting atmosphere. The feminism just falls off the page. It is amazing and you just want to shout out things like, “hell yeah” all. the. time. In Sawkill Girls we have to find compassion and forgiveness for those who were manipulated and who made bad choices for survival. Maybe everyone isn’t exactly what we thought they were. Maybe they can be more. Find Sawkill Girls on Goodreads, Amazon, Book Depository, and Indiebound. Give me all the feminist horror (but not too scary) book recs!